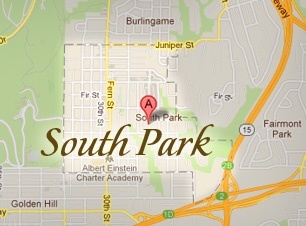 South Park is considered one of San Diego's oldest neighborhoods; located east of Balboa Park, north of the Golden Hill and Stockton neighborhoods and south of the North Park neighborhood. Iconic Juniper Street borders the north. First registered as a subdivision in 1870, but wasn't until 1905 when E. Bartlett Webster purchased South Park. The Bartlett Estate Company put in sidewalks, water, sewer, electricity, and other amenities and began selling lots, positioning the South Park neighborhood as a "high-class residential district". In 1906 spurred by the opening of the South Park and East Side Railway, an electric streetcar line linked South Park with Downtown San Diego, making South Park the city's first streetcar suburb. By the 1910s San Diego was a bustling growing city with Golden Hill to the south connecting the area now referred to as South Park to downtown. The 1915 Panama-California Exposition inspired the use of streetcars and an extensive San Diego public transit system built by John D. Spreckels. South Park with it's deep rich San Diego history has long been proposed as a registered historic district and considered one of the major historic urban communities of San Diego. Other historically significant neighborhoods not far from South Park include Burlingame, Golden Hill and Sherman Heights. is consolidated from multiple sources and includes current listings, recent sales, and more. Whether you're a buyer or seller, the knowledge you gain will help put you in control of your real estate transactions.